Between Christmas and New Year 2006 a group of increasingly haggard club members made the annual pilgrimage to somewhere with some green lanes to ride. As usual all of the participants have been urged to supply a written report of the event but equally as usual it looks as if this is not going to happen. Thus it is the Leader of the event who provides you with a few brief (Ha! ed.) 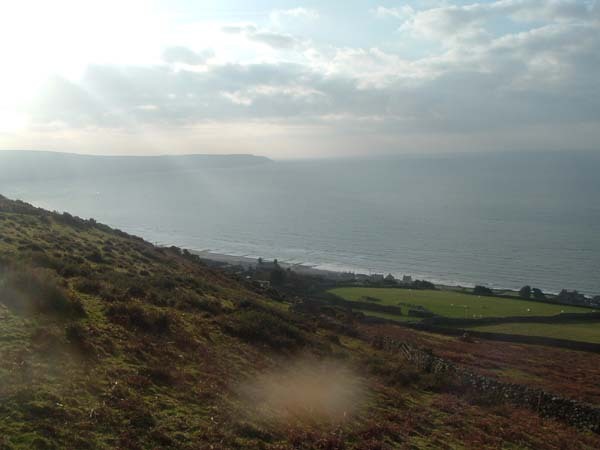 notes regarding the goings on of the 2 days spent in the variable weather of Wales. The advantage of this is of course the fact that events will be reported with honesty, with now exaggeration or fabrication. Credit will be given to all who deserve it and no personal bias will be applied. The author will naturally be scrupulously honest regarding any failing that may appear in his own riding. This year numbers were somewhat less than usual due to a variety of pathetic excuses from some club members. Things such as “I’ve just had a heart attack”, “I’ve broken my leg” and “my daughter is getting married”, were somehow seen as more important than a gentle tour around the Welsh countryside. Amateurs!! Despite some futile threats from some of the Welsh mob the final number of takers was a measly 5!! In no particular order, at least at this point, they were the Bream Builder (not the bionic one), the Retailer of fine motorcycles both Lancastrian and French, his brother the Engineer, the Stationer and the author of this piece of fine English prose, the Leader. Unfortunately the event started on the 27th, rather soon after the rigours of Christmas, but dictated by the breeding desires of the engineers 10 years and 9 months earlier. Even more unfortunately the start time was about 5 0’clock. Did you know that there was one of these in the morning as well? At this unearthly hour the party set off in 2 of Mr Ford's finest vans. I thought they were only available in black but no, “no brain white” with lots of stickers proved to be the tone set. For reasons known only to himself the Retailer chose to lend his old nail to the Engineer and the Leader whilst riding himself in the Stationers latest toy. I think he regretted it at one point as the Stationer seemed keen to prove that it was as fast as his Chav mobile Subaru by doing his best to catch the Retailers van in front. The fact that they were behind didn’t seem to mean anything. Well I suppose it is run in now! It’s probably best to gloss over the trip to the meeting point except to say that it was probably a good job that the Blacksmith, convalescing and known as a nervous passenger would probably have investigated Shrewsbury’s cardiac unit as well as Gloucester’s. ETA in Bala was 8:30 and it was there abouts that the party was united, meeting nearly head on in the High Street as both groups searched for that rarity in Wales, an open public convenience. The usual friendly comments about driving skills and rude remarks about vans accompanied the usual indecision about what to wear. Worse than the wives before the club do!! The toilet cleaner arrived as we were heading off and as they opened up they became exceedingly popular with two of the group, a visit to the first bunch of trees now being prevented! Now the important stuff started. This bit of Wales has been well visited by the Leader and the GPS was no more than a indication that the cheap cycle speedo on the CRF was 0.8 mph optimistic at speeds below 35mph but about the same pessimistic above that. How?? Lane 1 greeted us with a steep, slippery descent down a field, some thing that we ignored but had cause to remember latter on. A gate lead to a lovely half mile of reed filled bog masquerading as a sunken lane. On a CCM this used to be “stick it in 4th and let it rotovate its way through”. On a CRF230 it’s more like 3rd and give it some welly. The Retailer on his CCM showed good style which is more than the Stationer managed. Effective but inelegant is the best description. Nothing tricky with a bit of commitment and a reasonable tyre. A mile down the lane leads through a farm to a gradually deteriorating tarmac road which at a gate turns into another sunken road/bog. Common sense sees us riding the middle section balanced on the sloping bank along side to avoid a bottomless pit that looks like a skip filled full of liquid compost. Across this harmless stretch of grass/reeds/mud on a 20 degree slope the first wipe out of the day happened. Guess who? Yep, the Builder! 2nd lane , 10 minutes of mud and he’s up to his usual tricks. Naturally we all looked away to avoid embarrassing him and made soothing comments like “tricky that bit” and “ oh you poor chap” I have to assume that all the laughter, abuse and general ridicule must have come from the surrounding and amazed sheep. About here the Retailer realised that his incredibly sophisticated and modified variable height CCM stand was no longer all attached to the bike. It could have been his excuse not to open any gates for 2 days as he now had a half length stand with no foot on it. Apparently quite a rigmarole had been involved in creating this, involving calls to the Blacksmith regarding what type of welding gas was needed and special trips to purchase said gas. All to no avail. Apparently his penetration wasn’t up to scratch! This lane ends with a fast stretch of stream bed that has been bulldozed into a track. No problems except for the nearly invisible gate and the farmyard full of rabid sheep dogs at the end. We have never seen any humans here despite many vehicles, some even with wheels etc and smoke from the chimney of the rather traditional , read tatty, Welsh accommodation. It’s a place where no one wants to go first if we need to open gates and last whenever. ( cue twangy, “Deliverance” type banjo playing). The most wonderfully new looking piece of tarmac drops us down to village with an unpronounceable name, mainly “y”s and “th” s.
The next lane is the famous “out and back” job . This lane runs for several miles, or so it seems along the line of what was obviously a very old road with grooves from steel rimmed wheels evident throughout. It’s got stones, rocky ruts and sloping slabs of granite. Today they were covered in ice. A third of the way along there is a tight up hill bend that suddenly surprises you with an off camber rock slab. Well the Leader knew it was there and went wide. The Retailer and the Stationer remembered in time and the Engineer was warned by the Builder doing a complete 360 before gently laying the whole thing down. Crash 2!! By now the Retailer is looking happy. A trail ride with the Builder, especially on rocky going is always good for a 3 figure contribution to the Retailers till. We were into the routine by now. First person opens the gate, second goes through and pulls up to shut it and the next riders go for the next gate. You can cover some miles this way. The lane actually ends in the middle of a hilly bog. Or is that a boggy hill? A well tied contraption pretending to be a gate makes the last few hundred yards too much hassle, especially as they involve virgin hillside. To get to the gate involves 200 yards of stream/track with a deep hole half way along. Again prior knowledge saw the leader through relatively safely along with the two who had ridden this way before. Guess who found it? Well he did stay up right, just in time to drop into the other hole at the end. Much picture taking and bladder emptying took place before we all returned, upright this time to the tarmac and the village with no vowels. The next lane is short and straight forward although there is a nice sloping slab to catch the unwary out. Nothing worth a photo or an increase in the credit card bill here. We moved on to another old hill road that is really 2 rocky ruts with a built in stream to start with before it turns into a bit of a motorway where the local council tried to surface it a few years ago with slate chippings. Thankfully for us its washing away fairly soon and may in time return to the old 2 foot steps and sloping granite of the good old days. We trundle through another village that thrived in the days of slate but nowadays seems to support a pub and nothing else. The weather is looking good and spirits are high. Not for long. Up the in the woods is a “super lane”. Those of you who trail rode in the last century will remember the Monks Trod. Well imagine the wets bits with fir trees and up hill! Yep, here it comes. There is a picture somewhere of 4 happy, dry riders parked on a sloping road. The matching picture faces the other way, into the woods and the track looks harmless enough. That’s because the first 20 yards have been incorporated into a cycle track. The route goes off this like an alligator trail into the everglades of Florida. In the latter picture you may notice a yellow grit bin with clothing draped across it. That’s the leader showing prior knowledge again and stripping for action. The Retailer and the Stationer had also been this way in the last few months but the Builder had only experienced the lane from the other, easier end and the poor Engineer on his kickstart ( if it wants to and not when its hot) XR 400 could not believe that the warnings were not a wind up. Let battle commence. Just to lull the Engineer into a false sense of security the first few yard appear to have been gravelled as part of a mountain bike track but then a hole in a bush leads to the full beauty of the lane. Behind a fir tree there exists a scene more reminiscent of those old pictures of WW1 battle field. The Stationer dived in and stopped. The rest of us stepped back to watch. With commendable enthusiasm that was not so common later on he gave it a handful, pushed with all his little heart and the 525 moved. Not far but enough to encourage the leader to commit to the same bog, albeit in a different rut. The result was the same. 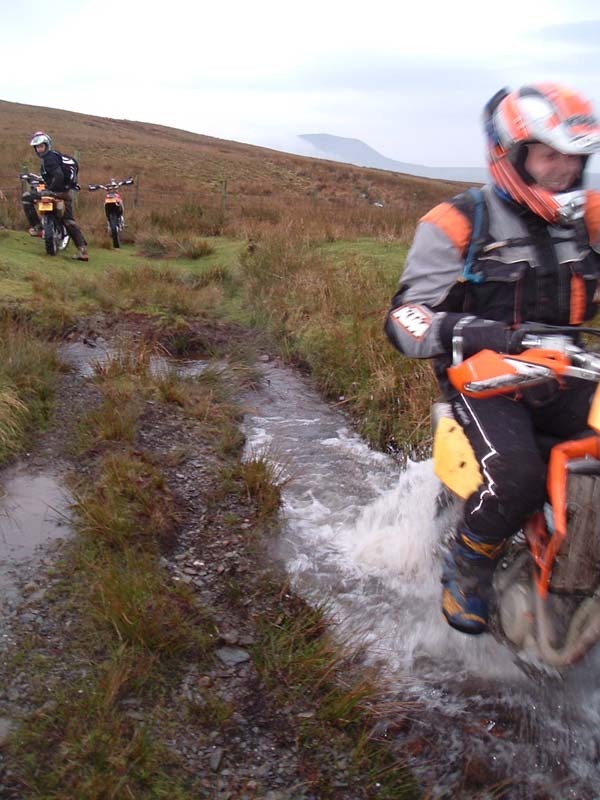 It was no point in waiting for the previous ride to clear the bog as this would have meant waiting for hours so everyone dived in with a universal attitude of “maybe he’ll fall over and I can use him for grip”. 598cc of Rotax gave the Retailer a fighting chance and with a roost long enough to coat both the Engineer and the Builder he actually made it through the first bit. There might well be a bit of video nearby that indicates the technique needed. It would be repetitive beyond this authors normal standards to describe much of what happened for the next hour or 2. Suffice it to say things didn’t get easier. The Engineer got more and more fed up with his kickstart and the Stationer got equally fed up when the 525 tried to reduce itself to the same level. At one point the lane turns up a hill. This is normally just a complete sod but a rather substantial fir tree now across it brought proceedings to a standstill. The Stationer investigated an alternative on foot which was then ignored by all, a more direct approach though a fir tree and heather bank appealing. As he was at the front the Stationer and the 525 were pointed across some angled roots with the predicted amount of pushing and swearing and dragged up this green mogul field. At least the line was now visible! 525’s make good rotovators, especially when the valves are bouncing in 3rd. 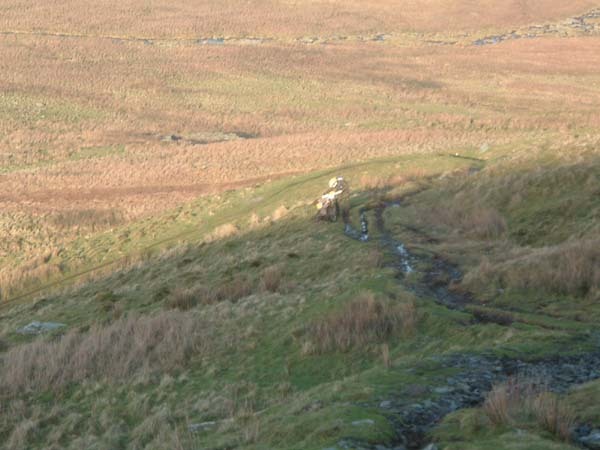 Once he made the correct route he disappeared and was occasionally seen over the next 30 minutes trying to get up the next 100 yard bank before abandoning it for another less vertical bog. With a little bit of pushing and shoving the next 3 bikes were persuaded to the top. This left the Engineer, the instigator of this section and the main pusher. First he had to find his helmet. After much wandering up and down through the trees looking at suspect bits of shiny rock, he was told that the Builder had kindly put it up a tree. To keep the dirt out apparently! Now the Engineer showed his true colours. A totally ineffectual attempt at the initial bank saw him going backwards into the fir tree causing the problems. His less than polite request to the Leader to lend a hand cannot be printed here. Let it be known that in over 30 years the Leader has never heard such language pass the Engineers lips! By now we were all spread out over ¼ mile of stick filled bog. Gradually we re gathered at a dry spot where a wall meant bikes could be abandoned without the falling into the primeval slime. A glowing Engineer finally joined the bunch aided by his brother. Brotherly love continued whilst the Engineer tried to perform to his profession on the XR’s side stand and the Retailer lovingly poked him with a stick. Funnily enough the helmet went missing for a while again. The XR may be a white plastic model job but its rider was by now a 2000 model red. On we went stopping only to drag each other out every few yards. 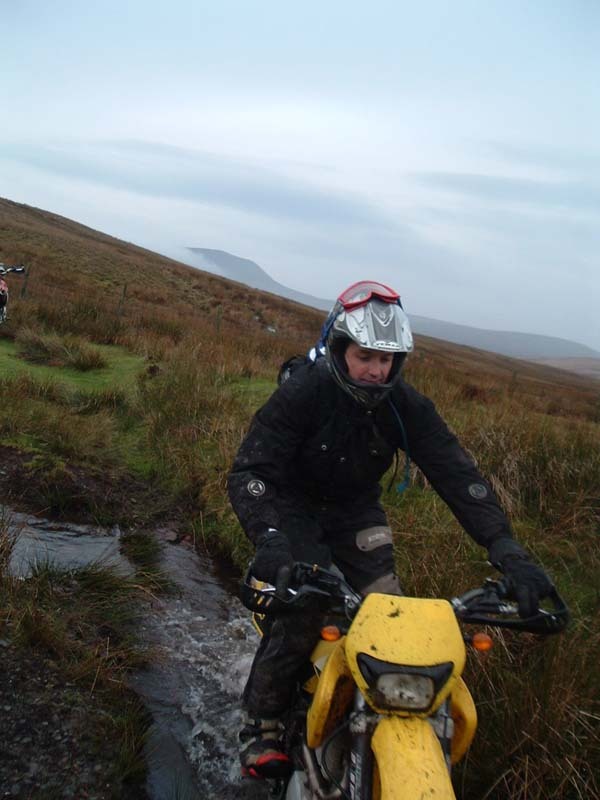 At one point the Leader, whilst standing on what appeared to be a frozen bog attempted to lift the CRF out of said bog. It didn’t come up, the lifter went down and the bike fell on top. A funny snapping sensation in the leaders’ knee was enough for him to politely ask that some one aid him slightly. The Retailer with his professional concern for machinery lifted the bike but abandoned the rider who expressed his lack of enthusiasm for the whole affair by kicking the bike over and politely requesting more immediate help. Slightly further on the same person had to extract the CRF by rolling it on to its side, then its back, the side again and then the wheels. The final sting in the uphill affair is a deep water filled slot that those who have been there before know has a firm bottom and is the only way through the last bog. The Engineer was somewhat disbelieving when told this and tried to ride the apparently firm borders to it. Well he had been told and paid the price for his cynicism. It was he that the infamous KTM dummy was finally spat out and ridden over. Even down the last miles of moorland the rain, which was by now torrential, had made matters rather sticky and it was a wet and now shivering quintet that gathered on the road. Never mind a quick blast along the A470 let to gathering hypothermia and the final lane on the outward journey. A Roman based road leads to some forestry type going and the A5 between the flesh pot of Betws y Coed and the death trap of Capel Curig. Fuel at the latter was forthcoming but the anticipated café at the same venue was closed. At this point death looked quite attractive but the leader using all his local knowledge disappeared up the road and found a café that stupidly agreed to let the party in. Brownie points were earned by ordering 5 all day breakfasts which were virtually on the table by the time the rest of the party arrived. The looks of the café and adjoining outdoor shop staff were priceless, especially when the Stationer wandered in leaving wet foot prints across the floor. At this point the Builder revealed that his choice of clothing for the day was rather inadequate. A T shirt with a layer of armour and a jacket were not enough, especially when soaked. He remedied this by buying a fleece before we all set off again. The Leader, being rather more organised stripped of his wet shirt, put on the dry kit that was shed before the bog topped it off with the still dry and unworn waterproof mac and the wet outer jacket. 1 of 2 pairs of spare gloves ensured that he was warm and dry from the waist up. Much moaning about cold kit later, especially from the Engineer who was wearing Mr Barbour’s finest wax cotton the party set off. The first lane just down the road is great for warming up being a half mile climb over rocks of all sizes before turning into a moorland track then forestry road. Handily enough the rain had stopped, just in time for the light to go as by now it was late afternoon and we were now back at the end of the super bog going the other way. Common sense set us on a road diversion of about 8 miles which was just what those with wet gear really wanted. Now the group were moving. Back up and across the resurfaced lane, the other way of course and the gate system was flowing well. Down the lane with the slab that caused no problems and along to the traditional farm house. The light was going and lights were needed for safety on the road. On past the scene of the builders second wipe out, slipping and sliding. It was clearing up and getting dark and the temperature was dropping. Strangely the riding was great. It was atmospheric and exhilarating. The speed was quite high yet no errors were made and the sense of urgency brought on by not wanting to be off tarmac in the dark kept spirits up. The last lane was the first of the day. A sunken road with overhanging trees was gloomy to say the least and not everyone managed to avoid the greenery. The Leader was the first to the gate where the bog ends and the half mile of slippery field begins. The 3 with enduro tyres fitted went off reasonably ok and the Engineer on his trails tyre shod XR made a reasonable stab. The Leader now alone in the virtual darkness found that the gentle approach didn’t work and needed 2 goes to reach the Retailer and the Stationed who were waiting at a gate half way up. 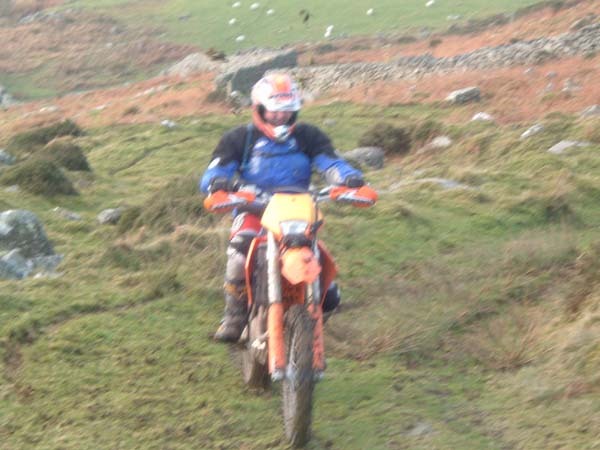 At this point the Leader decided that he would feel more comfortable on the 3 mile road ride back to Bala if he pushed the CRF up the last few hundred yards of the hill. Well that’s my excuse and I am sticking to it. The road to Bala was dark and the rain was coming down again. Goggles, thoroughly filthy from the day were pointless and everyone was glad to be back at the vans. The Leader and the Engineer being highly educated decided to share the, van get changed at the same time and sit snugly waiting whilst the self employed showed less initiative. Well the Builder and the Retailer did. The Stationer being the van owner and having the keys banished the other 2 to wait outside whilst he leisurely changed and sorted the van to his satisfaction. We had to assume that there was some form of physical deformity that brought on such modesty and lack of team spirit. Loaded up and sort of changed the party set off for the unknown quantity that was the night’s accommodation in Dolgellau, 15 miles away. Throughout the day the accommodation had been the source of some discussion. Booked was some from of bunk house in Dolgellau town centre. Little was known except we had to look for a key under a dustbin and we weren’t to take the one with Joanne written on it. This led to all sorts of fantasising along the lines that Joanne was going to be the leader of another 4 buxom blond goddesses whose only desire was to cook hot food, massage tired muscles and dry wet clothing. Unfortunately this wasn’t the case. Joanne turned out to be a frighteningly athletic and skinny brunette who was the only female in a bunch of 8 or so mountain bikers who had got there before us and had taken over the TV room and the radiators. Actually things weren’t to bad really and those of us who have experienced real bunk house accommodation found this positively luxurious. The showers were unlimited and hot. Very Hot. Very, Very hot. Luckily the Builder knows about boilers and turned the temperature down on the one providing hot water and up on the one heating the radiators. Within a short space of time the entire party were clean and presentable, the Builder smelling particularly fragrant as is his habit. Don’t know why he bothers, the sheep don’t like Brut. The first pub round the corner provided a decent meal and a round of beers from everyone and by about 10:30 beds were calling. The Engineer who was also assuming the role of Cook, I hesitate to use the term Chef, negotiated an unlikely short window in which to prepare breakfast before the cyclists and everyone soon had their heads down and lights out. Apart from excessively frequent trips to get rid of some beer the night was comfortable but maybe a bit too short. As usual the Leaders bladder fetched him out of bed at a time that could approximately be called morning. Some un-subtly noisy dressing woke the Engineer/Cook and moves towards breakfast were made. The Leader was surprised by the Engineers sharing attitude towards milk. The cyclist’s milk! It’s just a little bit he said as 5 coffees were sloshed full and anyway they won’t notice he added topping the bottle up with water. We did compensate them later, offering a few left over baked beans and a cold rasher of bacon to a particularly glutinous youth. The Retailer, wandering down in his usual early morning, near death like state, was sent out in the dark to find a paper shop for a bottle of cow juice that we could call our own. Suffice it to say the Engineer managed to knock up a fry up that ensured that we would not need to partake of any cholesterol for many days despite encroaching on Joanne’s cooking time slot and having to work around a rather healthy pot of porridge. Washing up done and rooms searched for errant socks and we gather in the now dawning glow of a morning in Dolgellau. At this point several people discovered that their Gore-Tex socks were still damp etc. Helmets were particularly nasty. It appeared to be a day that showed signs of drying up so heart searching went on whilst every one asked each other what to wear. More scenes of a bunch of wives wondering what outfit would do for the works Xmas bash. “Does my bum look big in this” might well have been a question that was asked if we could have seen into the future. Eventually some form of consensus was reached. 3 of us were all going in a little black number with a new wonder bra and last years high heels. (Well m/x jeans shower proof jackets and water proofs in the rucksack.) The Engineer (would make a good frumpy wife) bravely stuck to his wax cotton armour and treasured camo pattern Gore-Tex trousers and the Builder chose his best road riding jacket and trews. Some time later than hoped for by the leader but rather earlier than hopped for by some of the party we set off. Well some of us did. 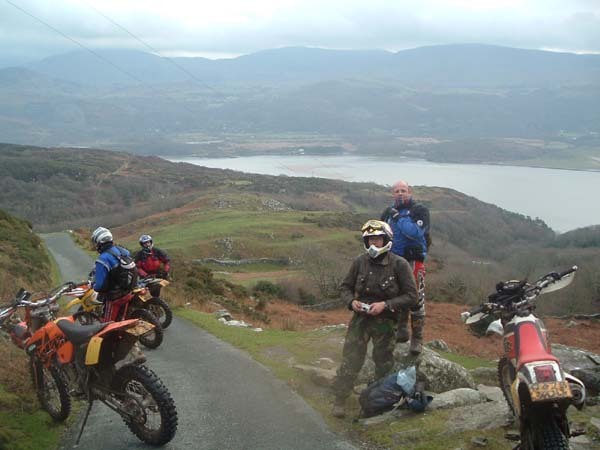 Whilst 4 riders were spread out over half a mile of the Dolgellau bypass, the Leader leaning against his rather small number plate outside the local nick, the Retailer was realising that his Clews Concrete Mixer was rattling even more than yesterday. An experimental look at the level tube showed that maybe a touch of oil would be off benefit. The message got passed up the line and we re-gathered to await his actions. 100 ml was poured in and the rigmarole of checking levels proved it wasn’t enough. 200 ml were added. Nope. Another 200. Same thing. 1.5 litres later it was showing. Not bad considering the total is only 2.7 litres. Off we went again. Attempts to install the GPS belonging to the Website Manager, to the bars of the Engineers bike, had failed due to the complicated mounting system and the need for ½ inch spanners to fit the knackered nuts. This meant that the first rate memory of the Leader was used with the GPS as a backup. A short ride down the coast ride leads to a turn off up a steep and deteriorating road to an old iron gate. Tough this, a shale hairpin steeply climbs to the side of the mountain. It must have looked comfy to the Stationer as he was seen lying down at this point. That 525 is ”a bit playful”, as Ginger would say, first thing in the morning. This lane is great. Great views as it switch backs along a hill side. 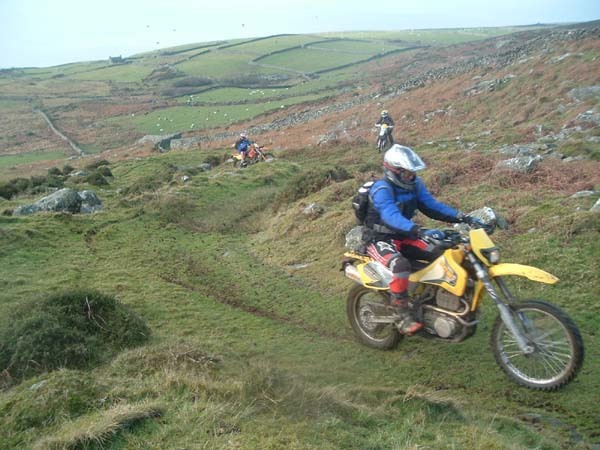 Walls, gates and big drops at time all on double sheep track until the stony bit where several people had to wake up. Somehow the Engineer got into the lead here. Must have skipped a gate duty or something. Well he did the same thing as several riders did last time the party came this way and went to the next gate, totally missing the turning to the left between 2 ancient stone embankments. He had to be fetched as he was playing deaf. We continued over grassy tractor ruts to tarmac. Eventually the Builder joined us. “I’ve lost me clutch”. Careless off him we thought. “Go back and get it” “No it’s the hose” “ Are you sure you aren’t getting confused? That’s the brake with a hose.” No, Super mechanic that he is, he had installed a hydraulic clutch and the hose had melted on the exhaust. 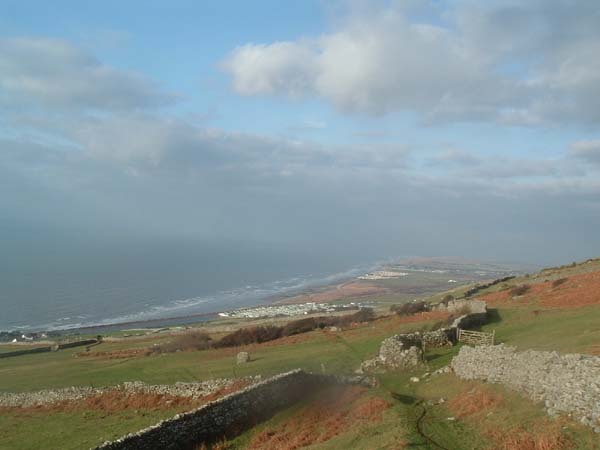 A steep down hill meant that he could roll to the main road and the decision was made to feel sorry for him and let him limp away from the vans towards Barmouth where we might be able to fix it! We didn’t see how he negotiated the junction onto a main road but I do believe that it wasn’t straight forward. Conveniently enough on the outskirts of Barmouth is a petrol station/cycle hire place which might have been able to supply a length of braided cycle brake hose. No such luck. They didn’t deal in bikes with brakes, only those that you can buy in super markets. Eventually the Leader plodded off into town to look for a tube of super glue to aid what ever was going to happen. It took a while as he had difficulty in persuading WH Smiths that he was old enough to buy the stuff. On his return a fuel tank breather pipe had been butchered and was ready to be glued around the damage and strengthened with a jubilee clip. Remember those best trews. Well not only did the Builders bum look big in them, it was. Crouching to do the work saw a foot long split appear where there should have been a seam. As could be imagined everyone was sympathetic and looked away. Naturally, throughout the day everyone was polite enough not to mention this incident to the Builder. Whilst this was all going on the Retailer and the Stationer were casually examining the contents of the Builders bumbag. There is a certain type of country gentleman whose tool kit consists mainly of those things needed to repair a fence or maintain and ancient Landrover. The Leaders father is one of these. This type of tool kit lives in an old bucket along with bent nails, rusty fencing staples, a bit of salt lick and some orange string. The builders’ tool kit looked as if a random handful of tools had been taken from some one else’s bucket. There was little in the way of metric spanners, lots of redundant socket holders with no sockets and at least 3 pairs of pliers and rusted solid. Healthier looking tools have been found in the wreckage of the Titanic. 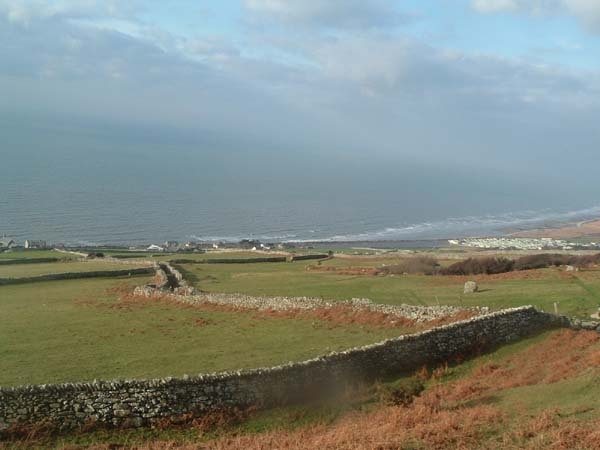 The ability of the repair to disengage the clutch was soon to be tested as the surprisingly complicated roads of Barmouth needed to be negotiated on the way to the next lane, the one that heads from the sea to the sky. This lane was another one that had been visited by some of the party in the autumn. It starts with a dog leg through a farm yard with a resident old lady staring out from a caravan. We assumed she was alive but you never know. Key more Deliverance type banjos. A dead level right angled turn leads to the twin walled lane that appears to head for the sky. Its surface is laid slate slabs, on their ends, covered with a rich layer of grass. On his last visit the Leader had been glad of a CCMs ability to pull from a stand still in 3rd and chug away like a tractor. In the front of the bunch he now found out that a CRF230 will do the same. This is not the sort of lane where one looks behind and so it was a gate on a thankfully flat stretch of the lane that he stopped to open it and let a load of air out of the rear tyre. For some reason there was a considerable period of time before the rest of the party appeared. The Builder was showing that a 404 could cope with this sort of thing and was making reasonable if inelegant forwards process as he passed on to the upper 2/3 of the lane. The Stationer was next, the 525 revving well. Good job the speedo isn’t linked to the rear wheel. The Retailer paused, probably just to prove that his CCM could do so before heading off and then the puffing Engine appeared. He graciously let the Leader go first. Pull off in 2nd, hook 3rd then 4th back to 3rd and there’s the Stationer going no where fast and the Retailer struggling past him. Down to 2nd, feet still up and shower the Stationer in cowsh**. Eventually the top was reached. Some photos somewhere show the steepness of the lane and the need not to have to have a second run at it. The Stationer appeared and the group sat to admire the view and share some chocolate. “Anyone seen the Engineer? The sound of a 4 stroke chainsaw showed that he was probably still alive and a moving cloud of steam, from an air-cooled bike! indicated his progress. When he appeared below the last corner the Builder kindly offered chocolate. Apparently the Engineer didn’t need any at that time. When he gained the flat every one kindly decided that he shouldn’t stop and lose his rhythm and off the party went. The next few miles are brilliant. An old road with grass coverage. Steep open hills above and below and a don’t fall off drop. Photos show the party struggling at several points here. 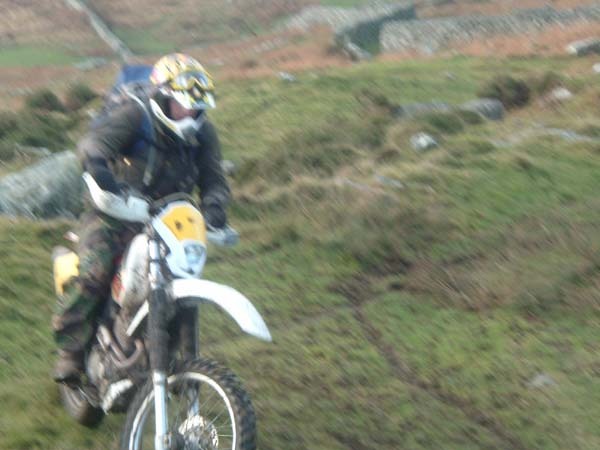 The Author/ Leader doesn’t want to appear smug but on this day he was thoroughly impressed with the ability of the CRF230 to climb steep slippery grass with minimal fuss out of all proportion with its reputation. 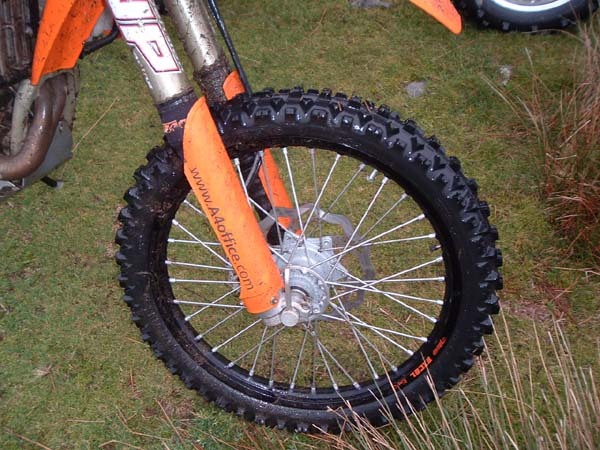 A rear trial tyre was no hindrance, although the Engineer similarly shod begged to differ. The lane led to a fantastic view point on the steepest tarmac road in the world. 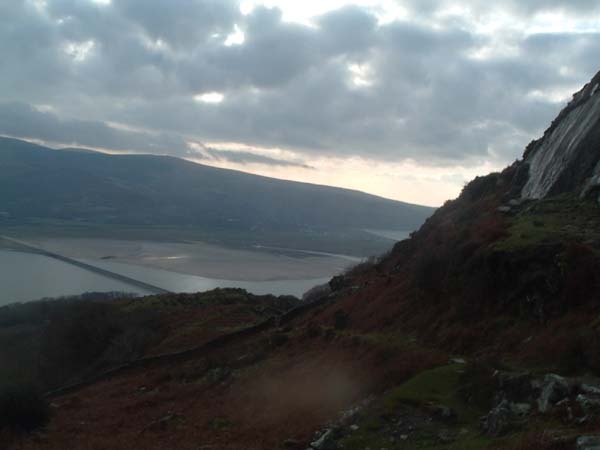 Cader Idris was slowly shedding its cloak of cloud and the day was turning into a great one. The clutch was still working albeit a trifle soggy and all was well. Along a single track road a farm appeared and a gate was opened by 2 smiling walkers. This flat and easy farm track leads to the point where the Engineer went astray earlier. At this point another switch back path leads high into the mountains. A view today made for a tough but lovely ride for a mile of so to a notch in the ridge where a similar descent led to a slippery stone slab pretending to be a bridge and then multiple sheep tracks. A small piece of video shows a KTM with a Stationer on board, if not in control, passing through a gate. The route drops from the low point in the ridge high in the distance. At this point the Leader swapped machines with the Engineer. Trading his state of the art, beautifully set up CRF for a XR400 was traumatic enough. A lack of electric start was even more so, especially with the distance of the seat from the ground. The reason behind this swap was not as generous as appears. 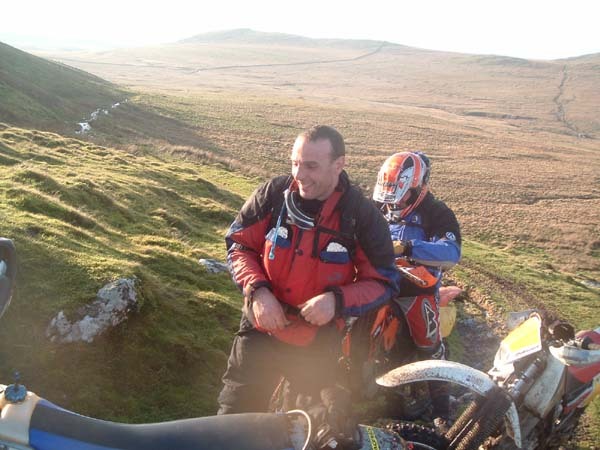 The idea was to allow the Engineer to use the CRF mounted GPS to lead the party to the lunch stop so increasing his enthusiasm for such devices and eventually creating an alternative Leader. Quite how a long and lanky owner of the XR could ride comfortably on his own bike is hard to imagine as the handlebar position is best suited to Quasimodo. Almost immediately tarmac was met and whilst gates were being shut a huge bunch of cyclists appeared. They can’t have been too traumatised by sharing accommodation as they stopped to pass the time. It was noticed, as an aside if you like, that Joanne did look very nice in Lycra shorts and quite possibly the Builder would have swapped the 404 for a mountain bike at this point, especially as his level of fitness would have meant riding behind the now lovely Joanne. With minimal diversions from the route, well there were only 2 junctions, the Engineer managed to navigate to a Spar on route where lunch was partaken and a clutch was topped up. On the happy party went, the Engineer leading and the Leader having been there before wondering why he was so slow. Surely he should have been able to think 3 junctions ahead. Eventually a half mile flatish grassy lane led us to the last lane of the day. This sound disappointing but its miles long and reaches about 550 metres above sea level. Old ruts filled with water and covered with moss lead to a grassy gravel track, at which point the Leader, knowing what was ahead, pleaded the need to do some intricate navigation and reclaimed his bike. Off the gravel again leads to an old hump backed bridge in the middle of nowhere which immediately leads onto a section of huge slabs laid across a bog to avoid erosion. Ahead of us we had seen another (large) group of riders coming toward us. As we were already embedded in this section complete with its slab bridge it would have seemed reasonable for them to give way but lead by an ignoramus in an orange jacket (he didn’t reply to our greeting) they attempted to push past. With more hassle than was really needed we went our separate ways, they to tear up the hill side and us to start on a huge hill side. Rough stones and mud lead past the point where the Leader had gone over the bars in the autumn and trashed the CCM s front mudguard to a hairpin where everyone paused to admire the view. Another photo here with the bridge in the middle distance shows the fantastic country side. Several video clips show the next half mile up a steep slope with precipitous banks left and right and a narrow water washed gully as the only intelligent way up. The Retailer lead off, for some reason choosing the less intelligent ridge between the gully and the drop off. He made a reasonable stab at this nut, as can be seen by several video clips, not every one did. The Leader, much more intelligent and liking to be able to put his feet down before the 100 metre drop chose the gully and parked smack in the middle of it in an attempt to persuade the following riders to attempt the more stupid but potentially more photogenic outer line. (Isn’t that some place in the Himalayas where the Indians and Pakistanis shoot at each other?) The Stationer went next, disregarding the parked obstruction and making an effective if not elegant job of the section. The Builder applied his usual technique in such sections. He didn’t crash to the bottom of the hill side in a sheet of lame and mud but he deserved to! This left the Engineer who we suspected was slightly disenchanted with his trial tyre wearing XR. He still hadn’t followed the Leaders example and reduced the pressure to near atmospheric. Again the stylish outer line was chosen. This time a near death experience was on the cards. He is still with us but how we don’t know. The video reduces the drop by a huge amount. Once he had a good piece of video coverage the Leader decided that if the group was to get home before next week that a pull might be in order. Once the group was reunited the rest of the climb was tackled. The marginally reduced angle was compensated by a bright mid winter sun directly in the eyes and without realising it, what is one of the best climbs around was done. A long sweeping and grassy ridge allows height to be dropped in a spectacular way. Gradually the walls start to draw closer and gates appear. Everything becomes more friendly and cuddly and just when it appears to be all over a sting appears in the tail. The Leader, leading from the rear was distracted by a small piece of smoking grass. Dragons was one possibility bearing in mind the location but then the amount of greenery that was spotted burning around the Builders exhaust earlier on came to mind. Whilst this piece of information was sinking in so did the front wheel, into a square sided hole and straight over the bars went the dreamer. At the next gate this piece on information gleaned the fact that it had probably fallen off the bike when the Builder found the same hole. This lane leads to a junction with the first one of the day just above the slatey hairpin. The Stationer stayed up right and we dropped to tarmac. 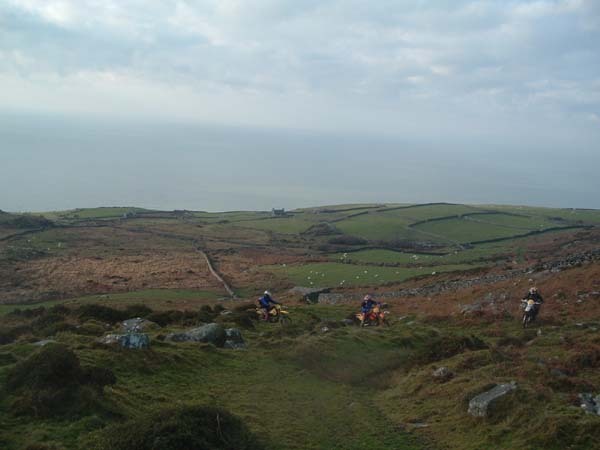 Whilst we were chatting about the day and wondering about going to do the first lane again a typical Welsh farmer on a quad appeared. Pleasant enough he told us exactly where we had been and that our vans were in Dolgellau car park. Bush telegraph I suppose. Turns out he was after the group we had seen earlier, along with a park warden. Both were not very pleased with orange jacket and his mates who had done the lane in the opposite way to us and have chewed up the pristine grass banks that we had rolled down. According to him our last lane wasn’t legal, a contradiction of the councils version. It sounded like he doubted the historical background as much as anything. He wasn’t unpleasant to us and we had an interesting chat about the dictatorial nature of the National park authority. The few miles back to Dolgellau were dry and pleasant and we arrived back at the van rather earlier than planned having a day shortened, especially by our farmers chat. We could have done more in the hour now left but the decision was made to have a lazy trip to the best kebab shop in the world in Machynleth and make our way home. All in all a good 2 days. No real injuries although the Leaders knee is still a bit unpredictable and the Builders wallet has had a serious rupture. Equally the Retailers bank balance has been improved by said rupture. 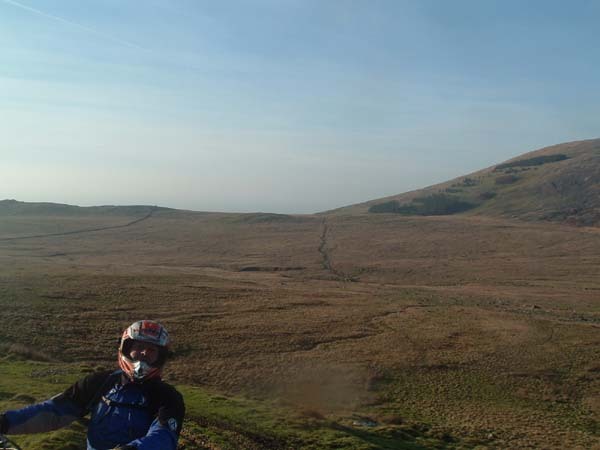 To any one who wants to have a good couple of days riding in an area that is rarely use this part of Wales is worth a trip. 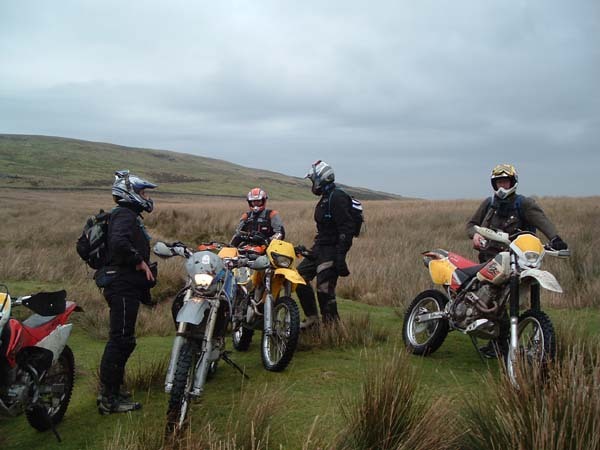 The group was riding a mixed bunch of machines, a CRF230 on trails tyres as was the XR400. 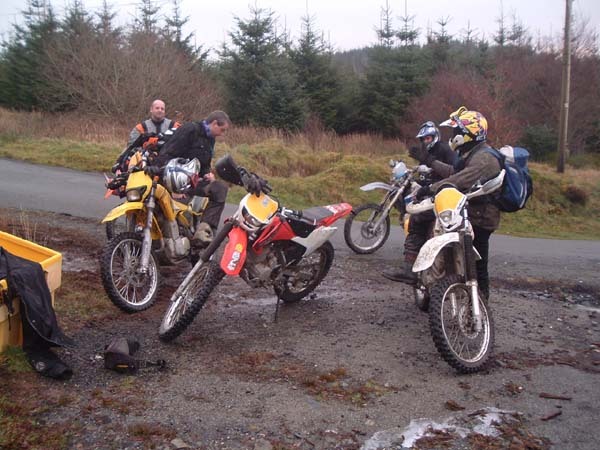 The EXC525, CCM 604 and CCM 404 were all enduro tyre shod. Fuel consumption was never a problem and apart from the mentioned problems mechanical issues were non existent. The Leader feels that there is some value in carrying at least 1 spare layer of clothing at this time of year and any group needs to be able to navigate their way back to the vans etc if there is a need to cut the intended route short at any point. Navigation was virtually by memory, the Leader having done all the lanes at least twice over the past 2 years including an identical route in the autumn. 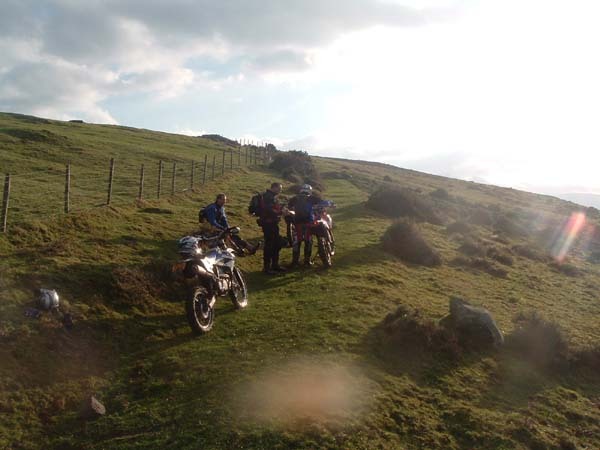 The routes were also included on a GPS using Touratech software and this was the way in which the Engineer took over navigation for 10 or so miles. The Leader now uses this method almost exclusively, OS maps living in the bottom of the rucksack for unplanned deviations. Photographs accompanying this article were taken on a digital camera as is the norm nowadays. The misty nature of some is a result of the inclement conditions faced. The bunk house was perfectly acceptable although a Lycra clad female cyclist may not always be in residence.